Whenever called upon to name my favorite TV show, I go for the neck-and-neck duo of Freaks & Geeks and Friday Night Lights. The two are similar in many ways, from their high school setting to their hour-long format infused with comedy (the former much more so than the latter). During this past half-season of Mad Men, I’ve realized it has been inching ever closer to making this a three-way tie. What, if anything, ties this trio together? How could I define my taste succinctly, as if that were a thing necessary to do? Then, around the time of the stunning mid-season finale “Waterloo”, I understood why this season of Mad Men was affecting me so deeply: the characters were smiling. I don’t need my television to be overly joyous; too much goodness can be as dangerous to artistic merit as too much bitterness. But over the last decade or so the playing field has become wildly uneven between the two. Recall the canon of this generation’s “Golden Age of Television”: Breaking Bad, The Wire, The Sopranos. The anti-hero tropes tethered them together, but so did a sense of reality, of not holding anything back (even the most heightened of these shows were still considered truthful about human nature, perhaps more than blatantly realistic). Now, there’s nothing inherently wrong with laying bare the cruelties of life, especially when representing groups that should garner more attention. No, the problem wasn’t the idea of considering these as great works of art. The issue was assuming darkness was the only path. Which brings us to the two crime-driven mini-series/anthology installments of 2014: True Detective and Fargo. The former is a woozy portrait of bad men keeping “other bad men from the door”. The latter, which still has a handful of episodes left, has a more structured balance between the abstracts of good and evil (Fargo is especially deft at tying these abstracts to detailed characterization, though more on that at another time). We don’t yet know how Fargo will end, and it has depicted the horrors of man, sometimes to a fault. But there, in the middle of all of this, is Molly Solverson (played by Allison Tolman, currently giving the best performance on TV). She may not win in the end, but that’s far from the point at hand. Friday Night Lights has plenty of examples of the world crushing the individual. Hell, the most optimistic show on TV, Parks & Recreation is full of human and systematic obstacles for our cheery lead characters. The point is that we’re seeing people try to be good. Breaking Bad is, down to its title, the story of a man becoming evil. The Sopranos was often about the impossibility of true change. But here, in Fargo’s Molly, we have an effort to make a positive difference. And this isn’t the naïve hope of what could be a joke in a darker series. This is a hero, without any need for that overplayed negative prefix. Compare this to True Detective, a series so intensely focused on the evil that eats souls that it had difficulty seeing much else (which, many argued was the point. Alas.) Whether or not you considered this artfully accomplished, it was unquestionably in keeping with the model handed down by late-90’s/early-00’s HBO. There was a greater sinister force out there in the world, but the characters we followed were better only in certain ways. Again, there is nothing wrong with this approach, though to my mind this series proved the pitfalls of the repetition of theme over a decade and a half of culture. At the very least, it’s why I’ll nearly always take something like Fargo over something like True Detective, all things quality assumed equal. It’s not as simple as wanting somebody to root for, and it’s not as reductive as needing good to win out. It doesn’t matter who wins; it matters who fights, and how they do it. Herein lies the reason that Mad Men will likely go on my all-time board far above Breaking Bad, a show I found mostly flawless. 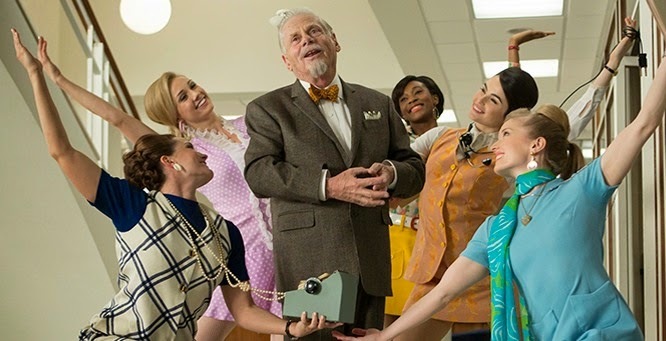 There are stylistic reasons, mainly that Mad Men often seems more adventurous in tone, but the core of my preference is that sense of optimism. Mad Men has been a grim show throughout most of its run, last season in particular circling the drain that Don Draper had become. But the show has always balanced, to some extent, a reason to be hopeful against the threat of personal stasis. The show itself is about these fundamental changes, for both better and worse. Yes, Nixon and Vietnam have entered in this decade, but civil rights have bettered and more positive change is on the horizon. The tides of history have always been a blend of progression and looming threats, and Mad Men is at its best when playing the two off of each other. And now, as the show nears its conclusion, we are given even more reason to hope. Ending on the note of the moon landing is purposeful, and even though a fairly significant death taints the day, at least that man was able to see that all important step and utter what may have been his last word in a state of awe. There is such unbridled hope captured here, and most importantly it is earned hope. In some ways, it may be even more difficult to accomplish what Mad Men seems to be going for, presenting those depths of sin and still ambling toward a better tomorrow. Because we saw Don’s lowest point, many times in fact over the years, the small victories of this season meant so much. “The Best Things in Life Are Free” is a great sentiment in a vacuum, but in the context of his life it is an incredibly powerful mission statement, a rejection of past obsessions and a glimpse toward a new day. For all we know Mad Men may again descend in its final seven episodes, returning to the notion that change is always tempered by still-open wounds. But I doubt it. Maybe I’ve just been swept up in the moment, but when looking at the night that man set foot on the moon, isn’t being swept up in it all kind of the point? “The moon belongs to everyone,” a now-deceased man sang, as Don Draper looked on, a mix of sadness and anticipation in his eyes. For too long, television has been sidetracked with the opposite of this sensation, relying on the world beating down its inhabitants. It has become noble, in some circles, to believe that there is some greater truth in pessimism, that somehow thinking that evil will always win and there’s no point in fighting back is “correct”. This line of thought extends beyond the TV, to different art forms and even to real life, with many finding solace in the notion of apathy being the wise man’s outlook. This has given us many good shows, and films, and even thinkers and writers. But it is not the only way to see the world. There are people fighting good fights. They may not always win. But sometimes they will. And that is how we get to the moon.